Grab your gears, put on your top hat, whack the monsters, and grab the treasure . . . with the power of SCIENCE! 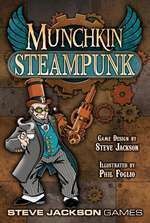 Munchkin Steampunk; brings the zaniness of Munchkin; to the pseudo-Victorian steampunk era. Bully! By George! Munchkin Steampunk core set is available for preorder through your friendly local game store, Warehouse 23, Books-A-Million, and 2nd & Charles retailers! Munchkin Steampunk features art from the illustrious Phil Foglio, the dapper creator of the Girl Genius webcomic and perrenial top notch fellow. So load up your dirigible and check out your local game store, Books-A-Million, or Warehouse 23 to order today, in the name of science!